Monster Giau, Mighty Giau, Killer Giau, etc., etc. Whichever adjective you want to use, one thing is sure: you need to ride it at least once if you’re in the Dolomites. 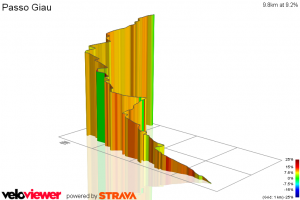 The numbers say it all: 9.8 km climbing with an average grade of 9.4%. But let’s start with a bit of interesting history. 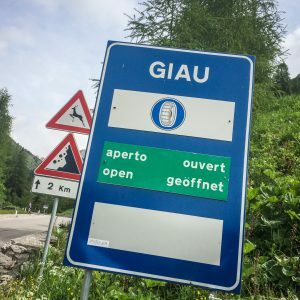 The Passo Giau road from Colle Santa Lucia was the last road that was built to reach a Dolomites Pass and connect it to another valley! In fact the actual road was built and paved in 1986. Previously, there was just a narrow muletrack mainly used by farmers for forestry services. So this is a young and bully climb! Even when my dad started organizing the Maratona dles Dolomites, he tried to avoid hitting the Giau because of its grueling rigor. I should remind you that the first editions of the Maratona where 180+ km long, hitting the Giau after 140 km in the legs. Likewise, the Giro d’Italia has only run through it 7 times. Compare it with the Passo Pordoi where the Giro d’Italia has had 38 transits. 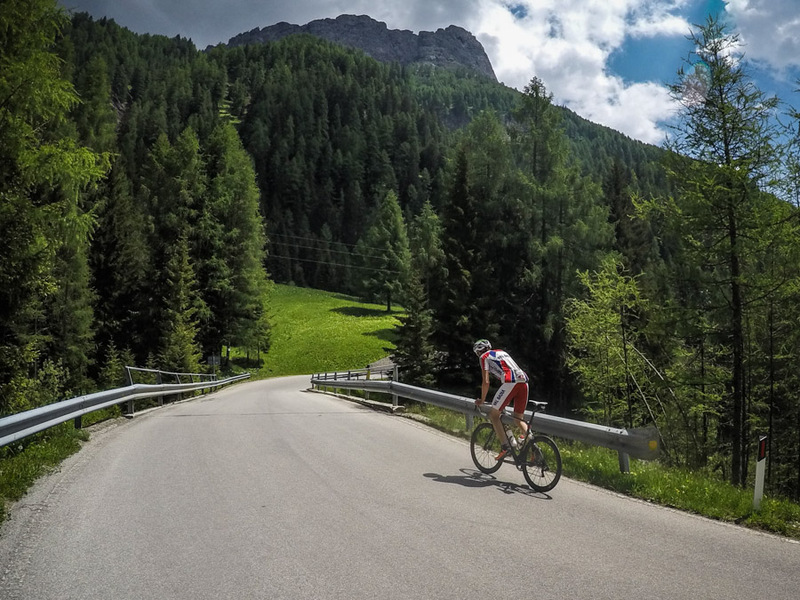 How does it look and feel to cycle the Passo Giau? As all climbs, it depends how many km you already have in your legs when you start to climb it. 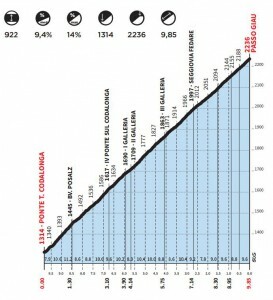 You will find the hardest grade (14%) at the beginning of the Giau, as you follow the river Codalonga. 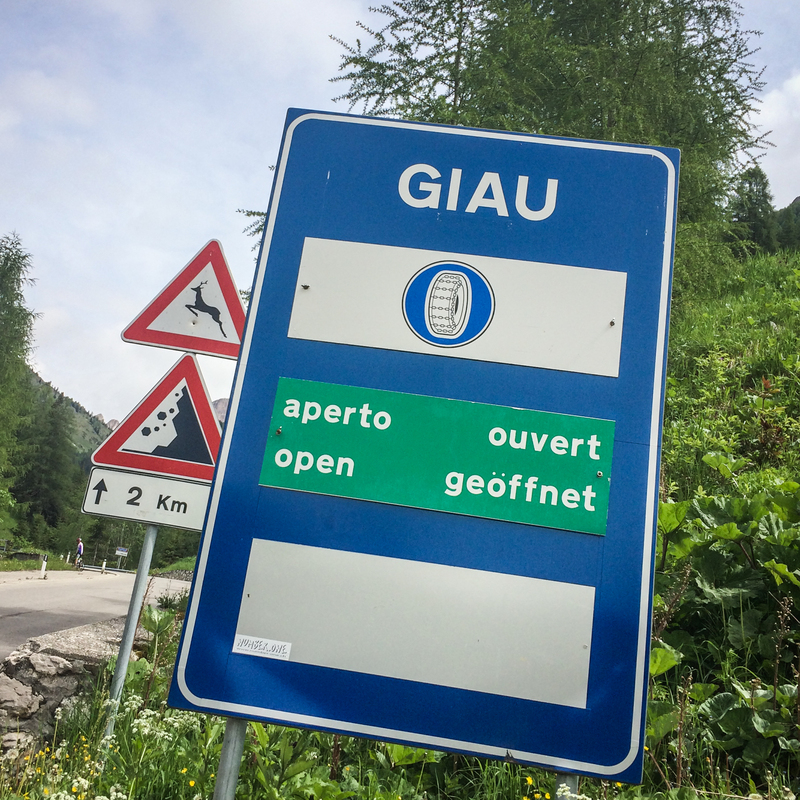 The Giau starts with 1 straight km without hairpins, and this is the perfect welcome card you need to find your climbing pace. It’s important to be focused on your condition and pace and not get influnced by the pace of your friends. Trust me, if you play your cards right at the beginning, you’ll catch up later with the other cyclists that have overstressed the first part of the climb on the last 2 km that are ready to ensnare you in a mouse-trap at the top. There are only 4 places on the climb where you will have 5 seconds to breathe and these 4 places are along the first 3 km. They are simply the bridges that overpass the river Codalonga. You won’t even notice when you ride over the first bridge, but following the first steep km, when you roll over the 2nd bridge just a few meters long, you’ll be glad that something like this exists! 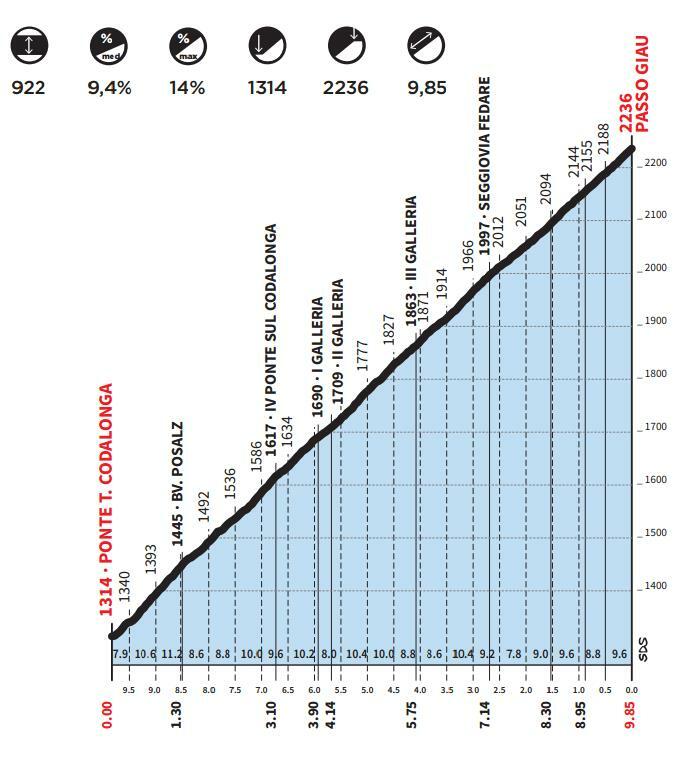 Luckily, after the first km, the series of 29 hairspins start – giving you at least something to look at while you climb. Indeed, the road grade will always remain between 9% and 10%. Half the way to the top, the trees start to give way to the classic Dolomites green pastures and, on a quiet day, you might even hear marmots whistle! At this point you’ll see a tunnel up ahead that prevents the road from being blocked during winter due to avalanches. The problem is that, while you can see the light at the end of tunnel, the 10% gradient makes it seem like you’ll never reach it! The optical illusion is even more comical if you have cyclists in front of you: you can see a silhouette pushing on the pedals ahead of you trying to reach the exit while it seems like you’re simultaneously near to it, too. Once out of the tunnel you will soon reach the first hut (Fedare Hut) on the Pass. You’re 3 km away from the top and, at this point, there are no more trees around, only a great view of the Nuvolau peak in front of you. Just another km (2 km to go) and you’ll start getting a peek of the hut at the top of the Passo Giau. This is the point where, if you have still some energy in your legs (something rare! ), you can push a little bit more and you will start surpassing many of your passionate tired colleagues! Finally, at the top of the Giau you deserve your own personal trophy: head inside the hut and order a big slice of one of the tastiest strudels that you can dig your teeth into in the Dolomites! The dark side of the Giau! Have you ever ridden this climb? What were your thoughts and feelings while you were climbing? Share them in the comments section at the end of this post. Did the Maratona today. Hit the Giau as No 436 in my Group. Left the Giau as No 940. I dropped 2000 positions in the race (total). Easily the hardest climb I’ve encountered sofar. I didn’t read your description of the route before the race – and I did everything which you warned against. I’ll try again next year. Morten, well if you did all the newbie errors now you know the hard way what you have not to do next time. I rode Giau in late August this year. It is truly a great ride – with a awesome reward at the end. It was a fantastic sunny day and I was full of pep crossing the Codalonga at the start of the ride. As you warned…..the initial kms are steep….and it never really seems to calm down. My riding partner wanted a few rest stops due to the gradient and length, but we kept soldiering on. We made it to the top with great effort, and also great pride. And the reward at the top is 360 degree views so spectacular I was humbled. There are some places in the world that have an aura about them greater than just their beauty. And I think the top of Giau is up there with Uluru (Australia) and Machu Pichu (Peru). It is a tough ride, but a fantastic ride. Absolutely awesome. Best ride in the Dolomites. Leave a Reply to Morten logager Click here to cancel reply.